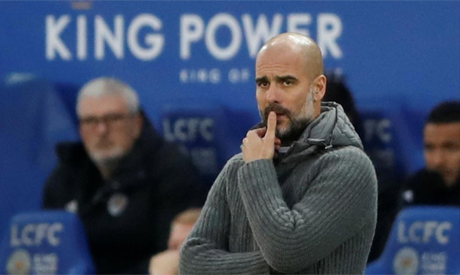 Doubts about their Premier League title defence would have crept into Manchester City's players' minds after a third defeat in four games, according to manager Pep Guardiola. The champions suffered a 2-1 loss at Leicester City on Wednesday as goals from Ricardo Pereira and Marc Albrighton cancelled out Bernardo Silva's early strike. City, who were also beaten by Chelsea and Crystal Palace in the league this month, have 44 points at the halfway stage of the season and sit seven points behind leaders Liverpool and one behind Tottenham Hotspur. "Now there will be doubts, and what you have to do is try to change the dynamic to winning and put in a good performance," Guardiola told Sky Sports. "I don't forget who we are, how good we are, how exceptional the lads are in the locker rooms. "The fact is we lost three in four, and the last two, and if you want to be real contenders we have to win again." Guardiola suggested that Liverpool and Tottenham were peaking at the right time while his team were lagging behind on current form. "They are better than us in that moment, you have to accept it, and it's important to accept where we are, and they are improving," Guardiola added. "The reality is there are two or three teams better than us. We're not talking about whether we can take Liverpool or get to Liverpool or whatever, the issue is about winning another game, and thinking in ourselves about how we can improve."